Accessories: Accompanied by Vacheron Constantin Extract from the Archives confirming production of the present watch in 1948. 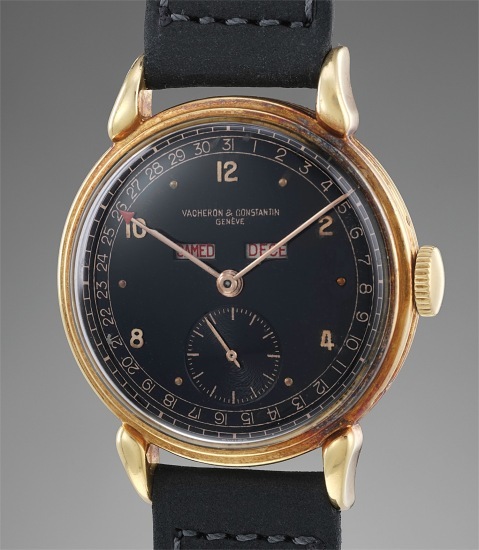 Vacheron Constantin has a long history of producing calendar watches. Its first identified complicated timepiece is a full calendar from 1790, and Vacheron Constantin made unique pieces during the following centuries. However, it was not until the launch of reference 4240 in 1942 that the full calendar entered the brand’s catalogue as a complication produced in series. The present reference 4240 is an incredible rarity as it is the only example known with black glossy dial and gilt printing. The gilt text shines through beautifully, the copper tone adding depth and charisma to the dial. The present watch displays a very attractive 35mm diameter yellow gold fluted case with wonderful downturned claw lugs. The red day and month are indicated via apertures and the date via a central hand. The case has developed a purplish hue due to oxidation, demonstrating the fact that the watch has not been worn for quite some time. The reference 4240 is one of the few vintage wristwatch designs by the firm featuring a triple calendar function, which was available with or without moonphase display. Because of its iconic status, the reference 4240 was relaunched in 2017 by Vacheron Constantin, in two versions again, with or without moonphase display. The combination of ultra-rare black dial and superbly preserved condition make the present Vacheron Constantin a tribute to the brand’s technical and artistic creativity, and is a must-have in the collection of every Vacheronista.